THURSDAY, 10 MARCH – Universiti Malaysia Sabah (UMS) has signed a Memorandum of Agreement (MoA) with the Sarawak/Sabah Kuala Lumpur and Selangor Heritage Society (PWSSKLS) that took place at the office of the Vice-Chancellor, today. UMS was represented by the Vice-Chancellor, Professor Datuk Dr. Mohd. Harun Abdullah, and PWSSKLS was represented by its Advisor, Dr. John Laurence William. Datuk Harun said, he was grateful to PWSSKLS for the signing of the MoA, which would involve an integrated education at postgraduate level. “We have seven courses offered under Master’s of Education namely TESL, Education Management, Computer in Education, Curriculum and Instructional Design, Science, Physical and Health Education and Counseling Psychology,” he said adding that these postgrad students would be attending their classes during the school holidays. Meanwhile, Dr. John Laurence informed that the students comprising school teachers were also ready to continue their studies at graduate level. “We will ensure that the students (teachers) who are attending this programme give their full commitment to complete their studies in accordance with the stipulated time frame. Many more will be joining the programme,” he said. According to him, the first cohort of student intake was 100 and would begin their studies at the end of April. 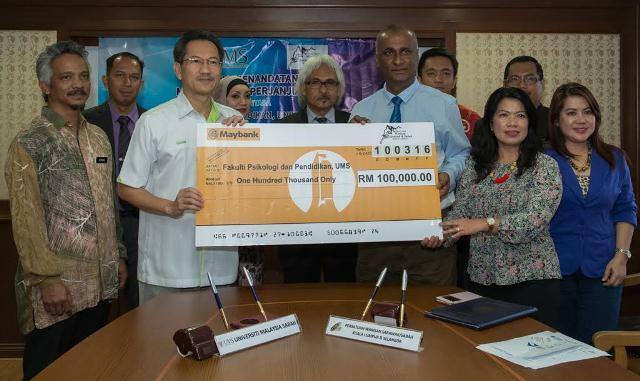 At the ceremony, Dr. John Laurence also handed over an education sponsorship to Datuk Harun amounting to RM100,000 and also announced that a contribution of RM5,000 to the Faculty of Psychology and Education (FPP) to sponsor a dance troupe that would be competing at the Borneo Hornbill Festival managed by PWSSKLS.